The art to make ‘impossible’ reactions work for organic synthesis by using the most powerful catalysts on earth – enzymes – is known as biocatalysis. There is one driving force behind our projects, i.e. cutting tedious asymmetric syntheses short. During the 1980s we have mainly been using industrially produced enzymes (such as lipases, esterases and proteases), which offers the advantage that the chiral catalyst comes in a nice parcel by mail. On the other hand, other chemists do the same. Confronted by some tough competition we went into Nature's supermarket (we usually prefer the NCIMB-, or IFO- and DSM-branch) in search for novel enzymes. Other people breed dogs, we subsequently started to grow our own ‘pet’ biocatalysts. This, of course, proceeded numerous heart-felt warnings by the microbiologists next door, who expressed their unshakeable belief that organic chemists are too stupid to grow bugs. Fortunately, the bugs did not share this prejudice. They grew well, because we fed them tasty goodies. After all, even microorganisms do not bite the hand that feeds them. Meanwhile our culture collection contains about 300 microbial strains encompassing bacteria, lower and higher fungi and, most recently, also a selected set of extremophiles. K. Faber, Biotransformations in Organic Chemistry, 7th edition, pp. 39-43. Springer, Heidelberg, 2018. Redox biocatalysis offers attractive tools for the asymmetric synthesis of enantiopure molecules by combining high chemo- and stereo-selectivity usually with environmentally friendly process conditions. Exemplary reactions are (asymmetric) reduction of unsaturated compounds containing for instance C=C, C=O or C=N bonds (i). Several enzymes have been investigated within our research group and the development of reductive biocatalytic platforms has granted access to a broad variety of enantiopure α- and/or β-substituted carbonyl- and nitro-compounds, secondary alcohols, or primary and secondary amines. Our favorite enzymes include nicotinamide (NAD(P)H)-dependent ene-reductases, alcohol dehydrogenases and imines reductases. These enzymes are nicely complemented by transaminases and amino acid dehydrogenases, when novel functionalities are to be incorporated (amino group). Oxidative reactions are also of interest, in particular if the biocatalyst shows high enantioselectivity on chiral molecules (ii), which results in kinetic resolution (KR) processes with racemates. Combining this step with (in situ) racemization increases the otherwise limited yield of the reaction to up to 100%, furnishing elegant dynamic kinetic resolution (DKR) strategies. Variations thereof have also been developed in our group (PIKAT). Oxidation reactions have been lately developed for alcohols, aldehydes or thio-compounds, employing among other alcohol oxidases and alcohol dehydrogenases, or Baeyer-Villiger monooxygenases. A rising topic in our group is the valorization of renewables, aiming at combining naturally abundant carbon source with natural catalysts (iii). Here, P450 enzymes revealed highly efficient catalysts on fatty acids, for instance in decarboxylation reactions to deliver terminal alkenes (including dienes) or in C-H activation reactions (regioselective hydroxylation). Incorporation in multi-step enzymatic sequences then affords α-hydroxy, α-keto and (non-natural) α-amino-acids. These redox enzymes typically rely on cofactors and/or coenzymes to transfer (reduction) or abstract (oxidation) electrons to/from a reactive substrate. A large number of them employ an external nicotinamide cofactor (NAD(P)H/NAD(P)+), often in conjunction with a flavin-coenzyme or a heme group, to shuttle electrons. For synthetic applications on large-scale, recycling strategies allow the use of (expensive) cofactor in catalytic amounts, while a (cheap) sacrificial auxiliary substrate serves as external electron source (reduction) or sink (oxidation). Although such technologies are well-established, they often suffer from an unfavorable environmental footprint impacted by the excess of co-substrate/product. We are working hard on developing alternative elegant strategies that allow recycling of cofactor, co-substrate or even reagent (oxidant). In some cases, we aim to affect equilibrium-reactions toward formation of the targeted products, while beneficial impact on overall atom-economy can also be observed (iv). Scheme: i) Stereoselective reductive biocatalysis; ii) Oxidation reactions; iii) Valorization of fatty acids; iv) Recycling strategies. ER: ene-reductase; ADH: alcohol dehydrogenase; IRED: imine reductase; AO: alcohol oxidase; BVMO: Baeyer-Villiger monooxygenase; P450: P450 monooxygenase; HicDH: hydroxy acid dehydrogenase; α-HAO: hydroxy acid oxidase; AaDH: amino acid dehydrogenase. Curr. Opin. Chem. Biol. 2018, 43, 97–105. Angew. Chem. Int. Ed. 2018, 57, 2864–2868. Adv. Synth. Catal. 2015, 357, 1655–1658. Angew. Chem. Int. Ed. 2008, 47, 9337–9340. J. Org. Chem. 2008, 73, 6003–6005. Angew. Chem. Int. Ed. 2007, 46, 3934–3937. Adv. Synth. Catal. 2018, 360, 2742–2751. Adv. Synth. Catal. 2011, 353, 2354–2358. ACS Chem. Biol. 2016, 11, 1039–1048. Angew. Chem. Int. Ed. 2018, 57, 427-430. Org. Biomol. Chem. 2018, 16, 8030-8033. Catal. Lett. 2018, 148, 787–812. Eur. J. Org. Chem. 2016, 3473–3477. Angew. Chem. Int. Ed. 2015, 54, 8819–8822. Angew. Chem. Int. Ed. 2018, 57, 427–430. Green Chem. 2015, 17, 2952–2958. Angew. Chem. Int. Ed. 2014, 53, 14153–14157. One of the most convenient features of enzymes is their ability to work together with each other in a single reaction vessel to establish a reaction system of multiple concurrent steps, a so-called biocatalytic cascade. These systems can boost yields, suppress the formation of by-products, reduce the ecological impact of a synthesis or enable transformations that could not be achieved by single-step reactions. Since the preferred reaction conditions of most enzymes are highly compatible with each other – aqueous medium at near-neutral pH and around 30 °C of temperature – the possibilities for combining them into cascades are virtually limitless. It is hence not surprising that many of our projects of recent years have been centered around cascade reactions. For instance, we have achieved the cascade oxidation of fatty acids into α-keto acids, the conversion of phenols into hydroxyphenyl lactic acids, the redox-neutral transformation of alcohols into amines, or the formal vinylation of phenols. J. H. Schrittwieser, S. Velikogne, M. Hall, W. Kroutil, Chem. Rev. 2018, 118, 270–348. S. Gandomkar, A. Dennig, A. Dordic, L. Hammerer, M. Pickl, T. Haas, M. Hall, K. Faber, Angew. Chem. Int. Ed. 2018, 57, 427–430. E. Busto, R. C. Simon, N. Richter, W. Kroutil, ACS Catal. 2016, 6, 2393–2397. E. Busto, R. C. Simon, W. Kroutil, Angew. Chem. Int. Ed. 2015, 54, 10899–10902. J. H. Sattler, M. Fuchs, K. Tauber, F. G. Mutti, K. Faber, J. Pfeffer, T. Haas, W. Kroutil, Angew. Chem. Int. Ed. 2012, 51, 9156–9159. Enantio: When a racemic substrate is subjected to an enzymatic reaction (e.g. hydrolysis), chiral discrimination of the enantiomers occurs, i.e. one enantiomer is converted faster than the other one. 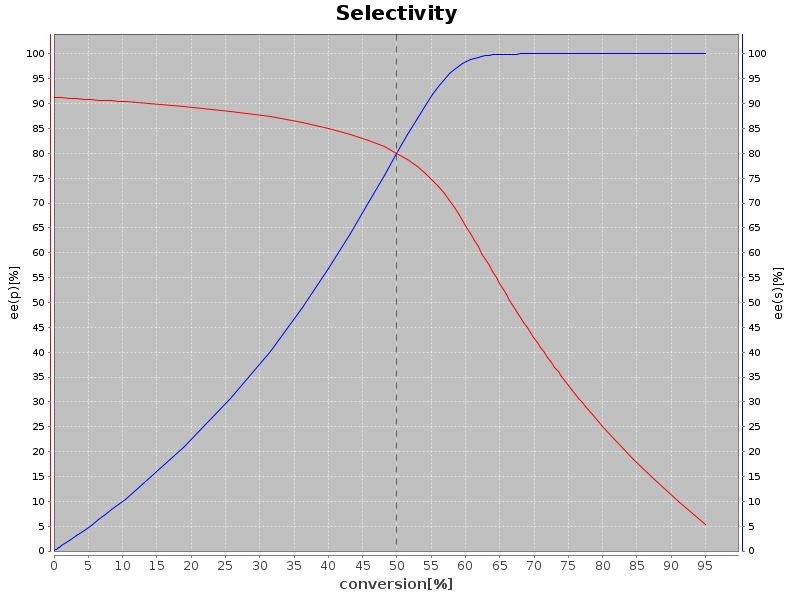 In an ideal case, the enzyme displays absolute selectivity for one enantiomer and no activity towards the other, yielding 50% of enantiomerically pure product and 50% of enantiomerically pure substrate. The dimensionless "Enantiomeric Ratio" (E), describes the ratio of the reaction rates for the two different substrate enantiomers and remains constant throughout the reaction. The E-ratio can be mathematically linked to the conversion (c) of the reaction, and the optical purities of substrate (e.e.s) and product (e.e.p) and can be calculated in our online tool. Codon Harmonizer: Codon Harmonizer is an online tool for the adaptation of genes to be used for heterologous protein expression. In contrast to codon optimization, the process of harmonization can be considered as a milder one. For some cases it can be advantageous that rare codons are not substituted by codons with high frequencies. Rare codons may function as regulators and give the protein time to fold through a different folding pathway to enhance correct folding and solubility. 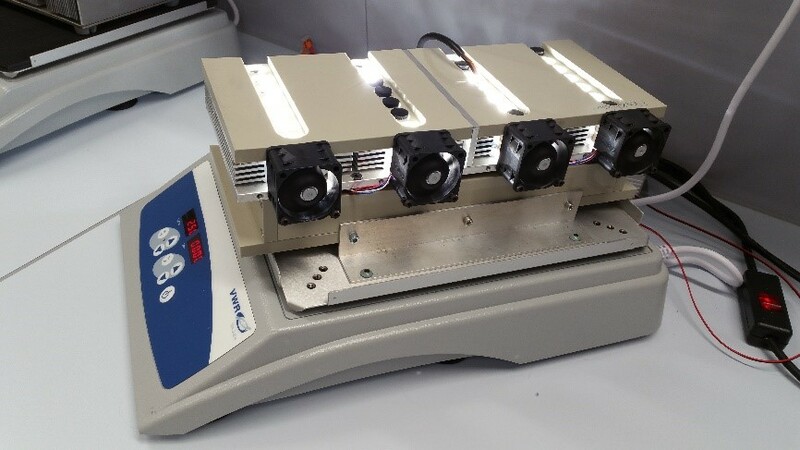 Codon harmonization can be seen as an alternative to the conventional "black box" codon optimization procedure and might help in solubilization of the heterologously expressed proteins. K. Faber, Biotransformations in Organic Chemistry, 7th edition, pp. 39–43. Springer, Heidelberg, 2018. Carbon-carbon bond formation constitutes the key reaction in organic synthesis to build up the carbon backbone of organic molecules. The elongation of molecules accompanied by the introduction of functionality and/or chirality enables the construction of complex compounds with considerably increased value. In our group a portfolio of enzymes which act via different catalytic machineries are applied for C-C bond formation reaction. The use of a bacterial acyltransferase enables the chemo- and regioselective C-acylation of phenols (Friedel-Crafts acylation) in the presents of a suitable acyl donor as well as the transfer of acyl groups (Fries rearrangement) without the need of prior CoA-activation. Decarboxylases from various microbial sources are pushed by elevated concentrations of bicarbonate or pressurized CO2 to run in reverse, catalyzing the regioselective carboxylation of (hetero)aromatics to yield the corresponding aromatic carboxylic acids. Starting from phenol derivatives, an engineered PLP dependent tyrosin phenol lyase performs C-C coupling and simultaneous asymmetric amination with pyruvate and NH3 to furnish L-DOPA surrogates. C-C bond formation based on the recombination of a phenol radical cation generated by a laccase and a CF3-radical (chemical method) enables the biocatalytic synthesis of organofluorine compounds. Overall, the corresponding products of the C-C bond formation reactions display valuable building blocks in various fields of chemistry (pharma, polymer, agro, materials, etc.) and often exhibit certain biological activities which is also true for the alkaloid products (such as tetrahydro-β-carbolines, 1,2,3,4-tetrahydroisoquinolines) obtained by pictet – spenglerases (strictosidine synthase, norcoclaurine synthase) or the berberine bridge enzyme. Chem. Soc. Rev. 2010, 39, 313. Org. Lett. 2012, 14, 1974. J. Biotechnol. 2013, 168, 264. RSC Adv. 2014, 4, 9673. Angew. Chem. Int. Ed. 2017, 56, 13893. Angew. Chem. Int. Ed. 2017, 56, 7615. Angew. Chem., Int. Ed. 2011, 50, 1068. Org. Proc. Res. Dev. 2013, 17, 751. Angew. Chem., Int. Ed. 2014, 53, 3731. ACS Catal. 2016, 6, 23. Angew. Chem. Int. Ed. 2018, 57, 10683. In order to provide access to chemicals that are important for our everyday life, oxidation reactions are an essential tool. Nevertheless, the conventional methods, especially when it comes to oxidative C-C bond cleavage, remain based on (heavy) metals. Many of these metals are expensive, in some cases toxic to the environment and may cause unwanted side reactions if not removed properly (e.g. allergic reactions, poisoning, etc.). Another matter is the proper installation of the oxidation states and thus the selectivity of the employed technique. A lot of effort is dedicated to the development of new oxidation methods, which fulfill economic as well as environmental standards. A biocatalytic pendant to the chemical ozonization process has been developed within our laboratories, based on a catalyst from nature (obtained from the fungi of Trametes sp.). Whereas the chemical process is highly delicate and special equipment as well as highly careful working techniques are required, the biocatalytic competitor is run under highly benign reactions conditions (room temperature, water, pH =6). H. Mang, J. Gross, M. Lara, C. Goessler, G. M. Guebitz, W. Kroutil, Angew. Chem., Int. Ed. 2006, 45, 5201–5203. H. Mang, J. Gross, M. Lara, C. Goessler, H. E. Schoemaker, G. M. Guebitz, W. Kroutil, Tetrahedron 2007, 63, 3350–3354. M. Lara, F. G. Mutti, S. M. Glueck, W. Kroutil, Eur. J. Org. Chem. 2008, 3668–3672. M. Lara, F. G. Mutti, S. M. Glueck, W. Kroutil, J. Am. Chem. Soc. 2009, 131, 5368–5369. C. E. Paul, A. Rajagopalan, I. Lavandera, V. Gotor-Fernández, W. Kroutil, V. Gotor, Chem. Commun. 2012, 48, 3303. In cooperation with a partner group from York (Prof. Gideon Grogan) oxocamphor hydrolases have been investigated in further detail. These natural catalysts cleave C-C bonds on the expense of water in β-diketone motifs. For example, prochiral compounds as shown below can be selectively opened to yield the enantiopure ester or acid. G. Grogan, J. Graf, A. Jones, S. Parsons, N. J. Turner, S. L. Flitsch, Angew. Chem. Int. Ed. 2001, 40, 1111. C. L. Hill, L. C. Hung, D. J. Smith, C. S. Verma, G. Grogan, Adv. Synth. Catal., 2007, 349, 1353. C. L. Hill, C. S. Verma, G. Grogan, Adv. Synth. Catal., 2007, 349, 916. E. Siirola, B. Grischek, D. Clay, A. Frank, G. Grogan, W. Kroutil, Biotechnol. Bioeng., 2011, 108, 2815.
developing new concepts to utilize visible light as energy source for biocatalysis by using water as electron-donor for enzymatic reductions in cooperation with Prof Kourist/TU Graz. "PhotoBiocatalysis: Biotransformations in the Presence of Light"; L. Schmermund, V. Jurkaš, F. F. Özgen, G. D. Barone, H. C. Büchsenschütz, C. K. Winkler, S. Schmidt, R. Kourist, W. Kroutil; ACS Catal. 2019, submitted. The formation of methyl ethers and the demasking of phenols are highly utilized transformations in chemistry and especially methylation and demethylation reactions are valuable for diversification of pharmaceuticals. However, chemical methylation methods usually require toxic reagents (e.g. iodomethane) and the biocatalytic alternatives depend on complex and costly cofactors and suffer from low turnovers. 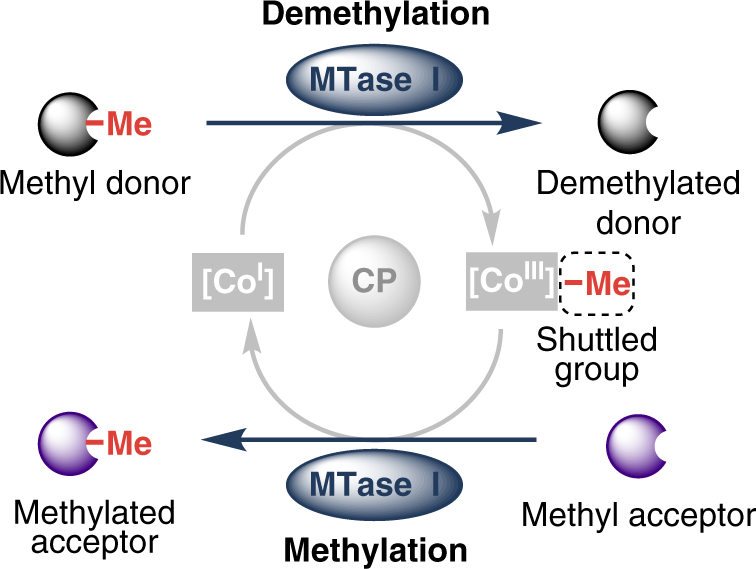 Therefore, we searched for alternative enzymes and identified the methyl-cobalamin-dependent methyltransferases. These biocatalysts catalyze the reversible formation (and cleavage) of methoxy-bonds and therefore, simple aryl ethers can be utilized as cheap methyl donors. J. E. Farnberger, N. Richter, K. Hiebler, S. Bierbaumer, M. Pickl, W. Skibar, F. Zepeck, W. Kroutil, Communications Chemistry 2018, 1, 82. N. Richter, F. Zepeck, W. Kroutil, Trends Biotechnol. 2015, 33, 371. "Redox-neutrale Biokatalyse: Intramolekulare Bio-Tishchenko Reaktion"
"Biokatalytische C-H Aktivierung mittels alpha-Ketoglutarat abhängigen Dioxygenasen"
"Austrian Center of Industrial Biotechnology"